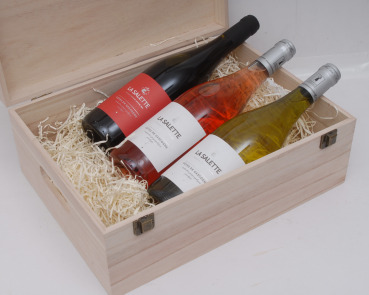 Featuring the modern wines from Domaine de La Salette. 1x Domaine de La Salette Blanc - Youthful dry white wine with hints of gooseberries. 1x Domaine de La Salette Rouge - Interesting blend of Cabernet Sauvignon, Merlot & Tannat. 1x Domaine de La Salette Rose - Mouthwatering Rose with notes of Strawberries.